Greenhouse gases – mostly carbon dioxide but also other gases such as methane, nitrous oxide and chlorofluorocarbons – trap heat from the sun and keep the Earth from freezing. However, ever-increasing levels of these greenhouse gases are causing global warming, which affects worldwide temperature and rainfall patterns. Ken Boote wants to know how this changing global climate could impact the world’s food supply. A specialist in crop physiology, Boote uses both experiments and computer modeling to predict how forage crops and food crops may respond to increasing temperatures and rising carbon dioxide levels, as well as changes in humidity and soil moisture evels. Boote and his colleagues use controlled-environment chambers and greenhouses to observe how climate change affects the photosynthesis, growth and yield of such crops as rice, soybeans, peanuts and dry beans. He and his colleagues have discovered important mechanisms by which crops respond to climate factors, noting the negative effects of temperature increases on plant reproduction and grain yield. The researchers have found changes in reproduction and grain yield at temperatures only 4 to 5 degrees Celsius above ambient air temperatures. 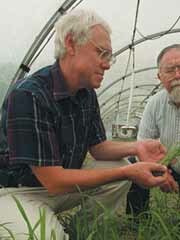 Using computer simulation, Boote takes what he knows about physiological changes in crops and develops models to predict the effects of global climate change on crop productivity. He helped develop, evaluate and test the CROPGRO computer simulation models of peanut, soybean and dry bean growth. “The crop models developed by Dr. Boote and his colleagues have been widely used internationally to predict the response of various crop species to varying environments,” says Jerry M. Bennett, chair of the agronomy department. A fellow since 1990 in both the American Society of Agronomy and the Crop Science Society of America, Boote in the last five years has received more than $1.1 million in grants and contracts as a principal investigator and has participated in projects that total more than $3.7 million in funding.